Over 300 historic photographs of Wilson County are now available on DigitalNC. These photos, from the Wilson County Public Library, include images of churches and schools and many postcards and photos documenting the long and rich tobacco heritage in Wilson County. The Colonial Inn of Hillsborough, N.C. 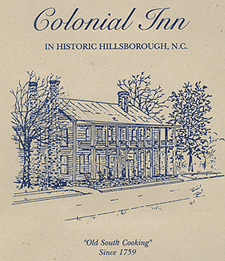 The Colonial Inn of Hillsborough, N.C., was a popular destination for Sunday dinner for many years before it closed its doors to the public in 2001. However, exactly how many years it served those dinners is a topic somewhat disputed. According to this menu from the Orange County Historical Museum, as well as the sign in front of the building, the Inn was built in 1759, and through the years was purported to have housed such distinguished guests as General Cornwallis and Aaron Burr. But this website about the history of the Inn states that it wasn’t built until 1838, after both Cornwallis and Burr had died. 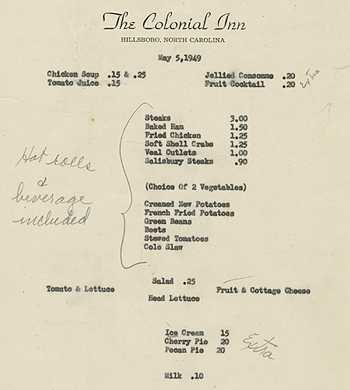 Perhaps a more reliable fact from the menu is that for Sunday dinner in 2001, you could get the ‘famous’ Southern fried chicken, a la carte, for $8.95, as compared to the price listed in the Inn’s 1949 menu: $1.25, including ‘hot rolls and beverage’. 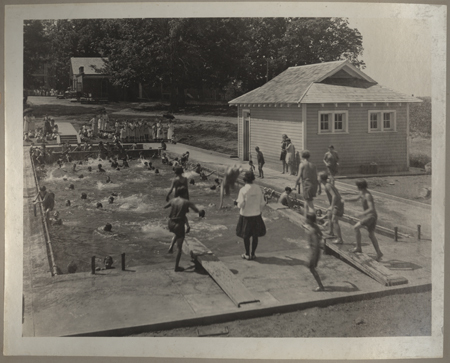 Life at the Oxford Orphanage wasn’t all work and no play, as this earlier post might suggest – other photographs from the same album show students engaged in more recreational activities than making shoes. I especially enjoy a series of photographs taken at their swimming pool. I like to imagine the second photograph was taken seconds after the first, maybe just after the woman in the foreground blew a whistle. These images are shared by the Sallie Mae Ligon Museum & Archives & Masonic Home for Children at Oxford. This 1899 photo is one of over 100 images from the Elizabeth City State University Archives now available on DigitalNC.org. 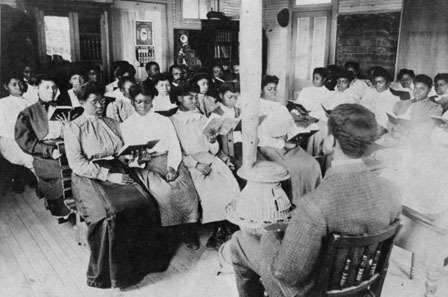 The University was founded in 1891 to serve as a training school for African American teachers. In the photo shown here, students are gathered around a wood stove to keep warm in one of the rented rooms used for instruction while the permanent buildings were under construction. The photos collected online document the rich history of Elizabeth City State, from the early days when it was known as the State Normal School through its becoming a member of the University of North Carolina system in 1972. Early issues of The Golden Bull, the student yearbook from Johnson C. Smith University, are now available on DigitalNC. 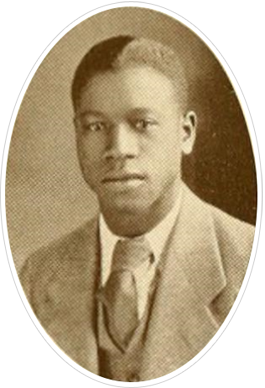 One of North Carolina’s early jazz bandleaders is pictured in the 1930 volume. Campbell Aurelius Tolbert, known professionally as “Skeets” Tolbert, grew up in Lincolntown, N.C. Tolbert’s professional career spanned the 1930s and 1940s, first as a backup musician and then as the leader of a group called The Gentlemen of Swing. The Gentlemen of Swing toured the east coast, and had a few of their songs captured on film, one of which, “No No Baby,” is available on YouTube. Tolbert lived in Charlotte again in the late 1940s when he taught high school music before moving to Texas, where he lived for the remainder of his life. 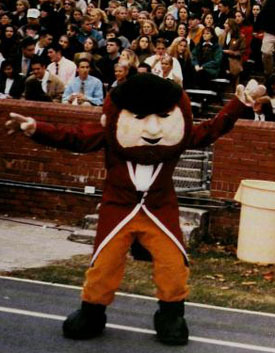 Elon College used to have one of the most original mascots in college athletics: the Fighting Christian. Shown here in images at a football game from 1998 and congratulating a homecoming queen in 1985, the Fighting Christian didn’t look especially combative or overtly religious. 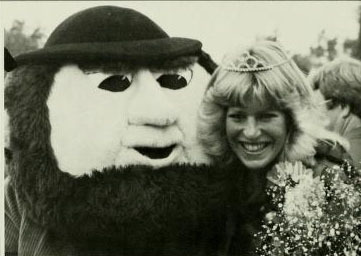 The choice of mascot may have been inspired by the proximity to nearby Demon Deacons and Blue Devils. In 2000, when Elon’s athletic programs joined a higher division in the NCAA, the mascot was officially changed to the Phoenix, in recognition of the school’s recovery from a 1923 fire. 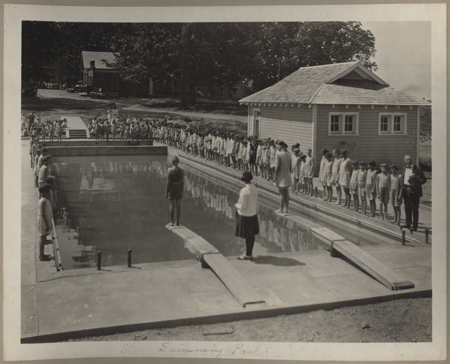 These images are from the Phi Psi Cli, the Elon University student yearbook. Ninety-four volumes of the yearbook, from 1913-2009, are available online as part of the North Carolina College and University Yearbooks project. Most of the materials collected in the Wilson County World War II scrapbooks on DigitalNC.org come from men who served overseas. Their fascinating and moving recollections bring to life the heroic and often tragic experience of war. The collection also documents the wartime service of a few women from Wilson County, including the very interesting memoir of Mary Harvey Ruffin. Ruffin joined the Red Cross and spent time at an American base in the Philippines. 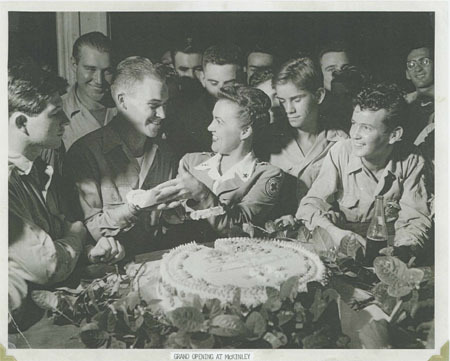 Her first-hand account of her service, along with copies of several of her photos, are included in the online version of the scrapbook. These World War II materials are shared online by the Wilson County Public Library. 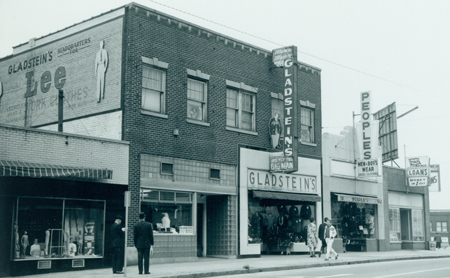 Gladstein’s men’s clothing shop, formerly located at 209 W. Mangum Street, was owned and operated for many years by the Gladstein family of Durham, N.C. According to a recent article from the Herald Sun, Gladstein’s used to be THE place to buy Levi’s blue jeans. If the mural in this photograph from the Durham Urban Renewal Records project is to be trusted, you could get your Lee’s there as well. The building was demolished during the 1970s, and the spot where it stood is now a parking lot. For more images of Gladstein’s (and the parking lot) see this post on the Endangered Durham blog. The stories of some members of the Gladstein family, who came to Durham from New York through an association with tobacco magnate Buck Duke, are told in a new publication from UNC Press, Down Home: Jewish Life in North Carolina by Leonard Rogoff, as well as a corresponding exhibit at the North Carolina Museum of History. The Durham Urban Renewal Records collection is shared online by the Durham County Library.